We understand that when it comes to delivering ads to your users, there’s not a “one size fits all” solution. Your users can be segmented into cohorts with distinctly different behaviors and expectations, and therefore require custom targeting to optimize their ad experience. Fyber’s new User Segmentation feature is designed to provide you with the tools you need to successfully segment and target your user base, based on a variety of usage, behavior, and demographic metrics. 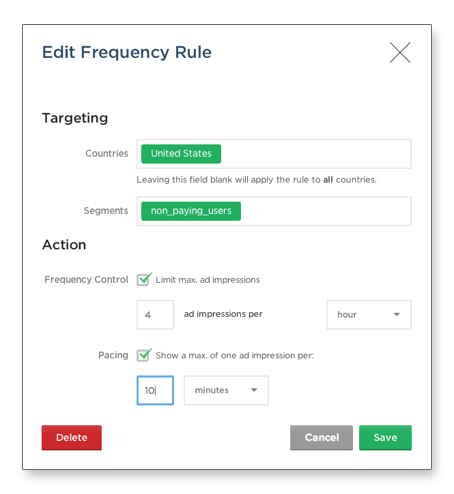 This feature, in conjunction with our existing ad delivery rules, allows you to not only provide your users the best-fitting ad experience, but also to maximize your monetization strategy and extract maximum value from every user. Before getting started, please ensure that your Fyber SDK is up-to-date. To set up User Segmentation, you must use Fyber SDK 7.0 or newer. Through the Fyber SDK, you can provide information about the user which can be used to define your segments in the Ad Monetization Dashboard. Fyber offers a wide array of pre-defined parameters to segment your user base. To name a few: in-app purchase amount, last session time, account creation date, age, and gender. You can also define custom parameters in the form of a key:value pair. For more information on how to use the Fyber SDK to provide user data, please see our documentation. The next step is to identify your different user groups and the parameters that define them. As previously mentioned, you can select from Fyber’s pre-defined parameters or set up custom ones. Once you have decided how you want to define your user segments, you can set them up through Fyber’s Ad Monetization Dashboard. For example, let’s say that you would like to differentiate the ad experience for paying vs. non-paying users. You can simply set up two different segments that are defined by the parameter, “IAP amount”. This will allow you to refine your strategy and monetize these two user groups in a distinctly different way. You can create as many user segments as you need, and if you don’t find the criteria you require among Fyber’s pre-defined parameters, you can create your own parameters to fit your requirements. 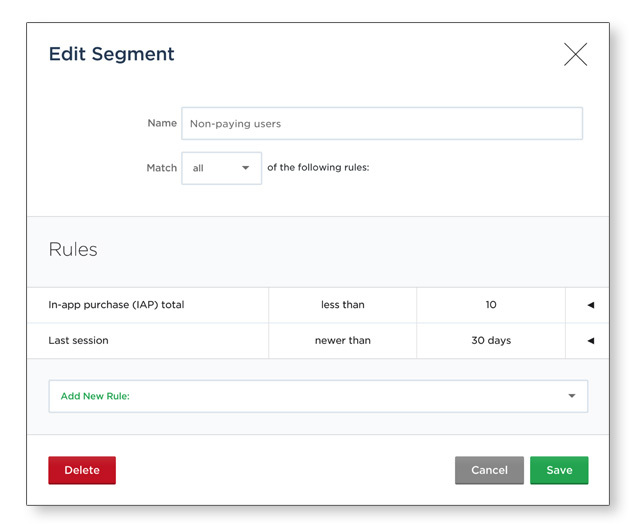 Using Fyber’s segmentation feature in conjunction with ad delivery rules allows you to easily determine how you want to monetize your different user groups and customize their ad experience accordingly. Let’s take again the example of paying vs. non-paying users: You could choose to create a rule that limits the frequency of ads shown to paying users, or choose to eliminate ads to this group completely. On the other hand, let’s assume that you want to boost the number of ads shown to non-paying users in order to drive more revenue from ad monetization. You could set up a frequency rule that applies a max number of four ads per hour, paced 10 minutes apart. As with any ad delivery rule, you have the option of applying it globally or just to a particular country, allowing you to differentiate the user experience on a regional level. To implement this feature, please ensure that you are using Fyber SDK 7.0 or newer. You can download our latest SDK through Fyber’s Developer Portal. For more detailed information, including how to set up segments and customize the user experience, please read our user guides for iOS and Android. If you’re ready to get started, please contact your Account Manager.